Helsinki is the capital city and most populous municipality of Finland. It is located on the shore of the Gulf of Finland and is the seat of the region of Uusimaa in southern Finland. Air traffic is handled primarily from the international Helsinki Airport, located approximately 17 kilometres north of Helsinki’s downtown area, in the neighbouring city of Vantaa. 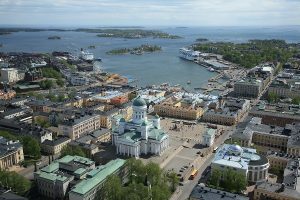 There are international cruise ship docks in South Harbour, Katajanokka, West Harbour, and Hernesaari. Ferry connections to and from Tallinn, Mariehamn, and Stockholm are serviced by various companies. Finnlines passenger-freight ferries to Gdynia, Poland and Travemünde and Rostock, Germany, are also available. St. Peter Line offers passenger ferry service to Saint Petersburg several times a week.